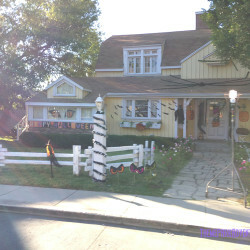 Halloween is in the air, but summer is still making things hot, hot, hot at the top of the hill at Universal Studios Hollywood as tourists visit the park from around the world, and locals take one last family trip before school season has settled back in here in Southern California. 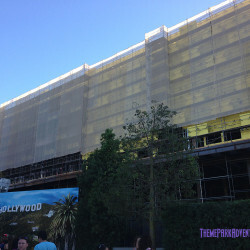 It’s a weird transitory month, making it an even more interesting time to bring you our latest Universal Studios Hollywood update! 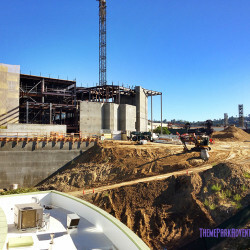 There is a lot going on at Universal Studios; the simultaneous growth and expansion that the park is currently undergoing is the most aggressive and large-scale in its history. We’ve said it before, and we’ll say it again and again – it’s an exciting time to be a Universal Studios fan! 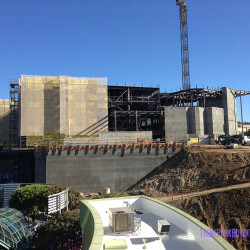 Universal Studios’ Upper Lot is where a huge chunk of the action is taking place these days. 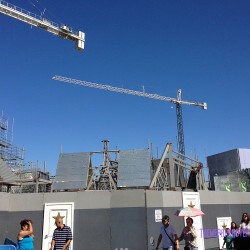 Massive cranes are in place where construction is in full swing for The Wizarding World of Harry Potter, which is scheduled to open in 2016. The cranes are visible from just about every section of the park, and from neighboring cities as well. 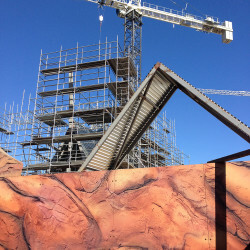 The iron framework of what will be the village of Hogsmeade has taken shape, with the area becoming more and more dense with each passing week, it seems. It’s amazing to see it all going up, knowing that before long, the skeletal frames will be transformed into charming “old” buildings that look like they’ve been there forever. 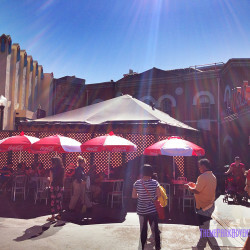 The most dramatic views of Hogsmeade can be taken in between Shrek 4D and Flintstones Bar-B-Q. 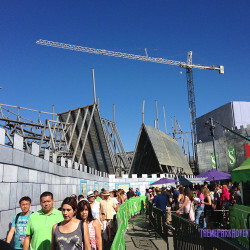 In the rear of the construction zone, the massive show building for Harry Potter and the Forbidden Journey towers above the unload area of the Studio Tour. 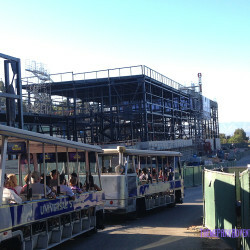 Guests can get great views of the attraction under construction from the Studio Tour’s entrance/exit bridge. 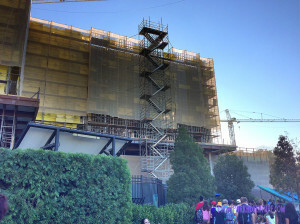 And of course, visitors exiting the Studio Tour can’t help but look up at the structure, as it looms right next to the tram unload area and stroller parking. 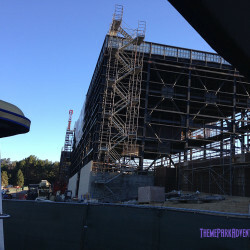 For now, you can still see the building’s dense interior – but the day is coming very soon that it will all be covered up, and then the real magic begins inside behind its walls! 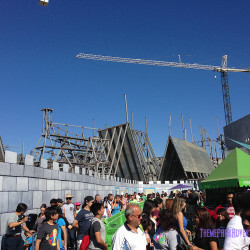 There is no landscaping at all anywhere at Wizarding World of Harry Potter; we’re still too early in the game for that. 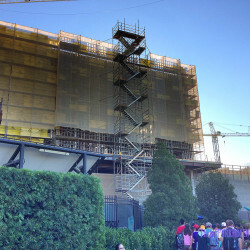 And as far as we can see, there is no physical area development taking shape yet for Forbidden Journey’s rumored huge exterior overflow queue; that stuff likely won’t begin to take shape until next year. 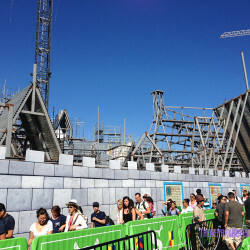 From the unload/stroller parking area of the Studio Tour, you can look up the hill at at Hogsmeade for now; how visible it will be from that angle once the new area is complete with foliage and landscaping is unknown at this point. 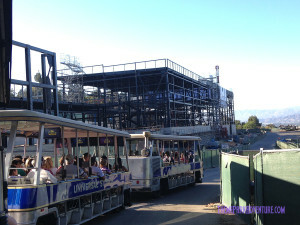 For now however, it’s a cool view into the land under construction! Right next door to Hogsmeade is Springfield, the new Simpsons expansion that will feature new dining and retail locations. And we mean it’s right next door; guests passing by likely cannot (or don’t bother) to look up and make a distinction between Potter and Simpsons, but if you do take a moment to look, the division between the two worlds is very obvious. Hogsmeade’s buildings are pointed and very… well… Potter-looking. Springfield’s buildings look more like traditional structures, squared off and rectangular as they rise into the Upper Lot’s skyline. 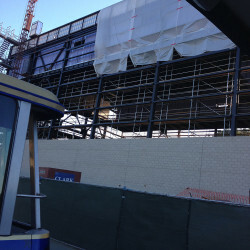 The best place to see Springfield construction is directly in front of The Simpsons Ride, near the entrance to the Studio Tour. 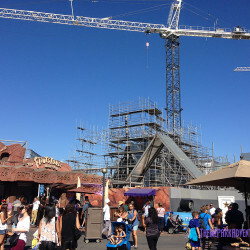 Eventually, the two areas – Springfield and Hogsmeade – will be completely separated from one another; for now however, the entire construction zone looks like one continuous metal jungle. 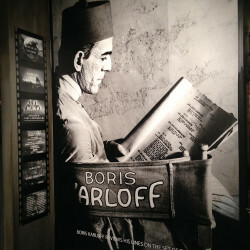 The Springfield expansion is scheduled to open in 2015, so we expect to see its progress accelerate much faster than Potter’s in the coming months. 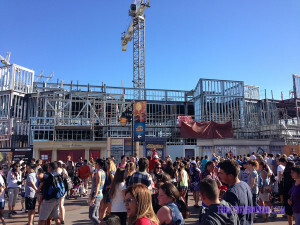 With Halloween Horror Nights 2014 lurking just around the corner, fans know that Universal’s mazes are in full construction mode now around the property. 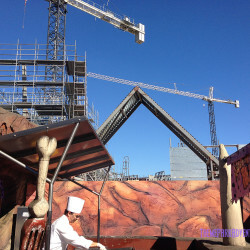 The Upper Lot is home to one of the event’s mazes this year – Dracula Untold: Reign of Blood, which is located in the Parisian Courtyard, just feet away from the new Universal Plaza area and Mel’s Diner. 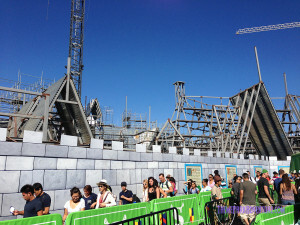 Guests resting or stopping for a meal in this spot likely have no idea that just on the other side of the construction wall, one of Horror Nights’ new mazes has taken shape. 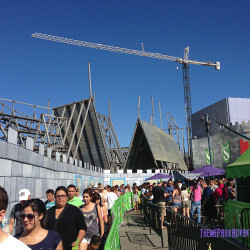 As was the case last year with the El Cucuy maze, we suspect that the switchback queue for Dracula Untold: Reign of Blood will fill the Plaza. 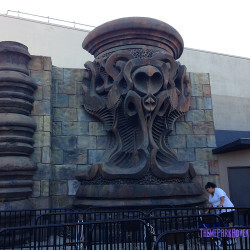 Speaking of the Plaza, there is a new photo op location that’s available to guests now featuring the kooky characters from the new stop-motion adventure-comedy film The Boxtrolls. 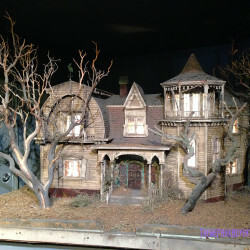 The latest creation from the makers of Coraline and ParaNorman features well, troll-like characters that Universal has created a really cool vignette photo location for. While children and their parents may not know exactly who the new characters are at the moment, there’s no doubt that the line to get photos taken with these strange and fun creatures will get longer once the film opens and guests know more about it. 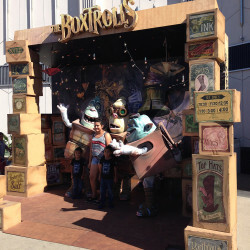 The costumes look great, and the quality of the photo location is really high; we certainly stopped in for a picture or two with the Boxtrolls! 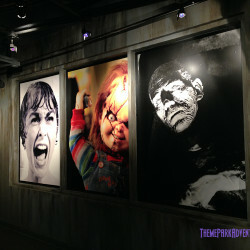 Currently, there is no official word as to what will be replacing Universal’s House of Horrors. 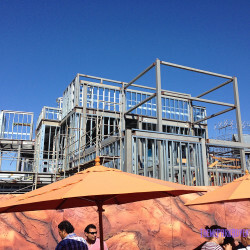 It’s a fairly large footprint, and in the past has served as both a walk-through attraction as well as a restaurant. 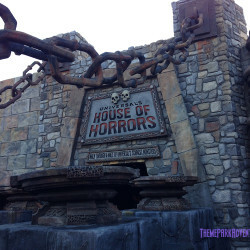 There’s speculation that we could see a large sit-down restaurant replace House of Horrors. 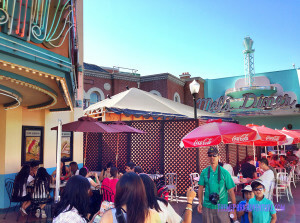 Many fans aren’t terribly receptive to that notion, but in all fairness, a nice full-service restaurant is the only type of F&B offering that Universal Studios Hollywood is lacking within its gates. Certainly, there are a lot of options throughout CityWalk; however, those are tenants. Universal Studios doesn’t see full profit from anything at CityWalk. 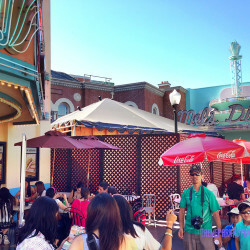 A large, full-service restaurant within the park itself would round-out Universal Studios’ dining options nicely, and if themed properly – could be a really fun venue as well. However, nothing has been announced, so all we can do as fans is speculate for now. 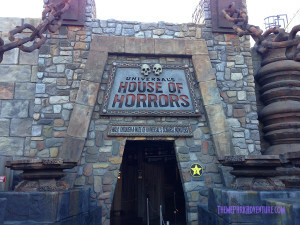 A thank you to everyone that has had something to do with House of Horrors over the years, from its design team to those individuals who worked hard as talent each day, scaring the hell out of guests non-stop! 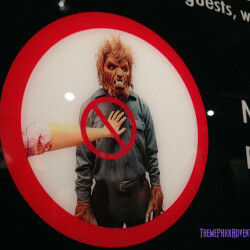 It’s indeed, sad to see this Universal Studios staple fade into the history books. 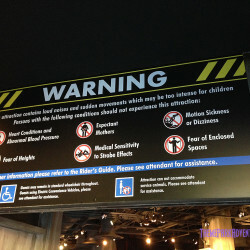 However, it is the way of this industry, and we are grateful that we had this fun attraction to enjoy as long as we did! Heading down the Starway (which finally has a new soundtrack – way overdue!) 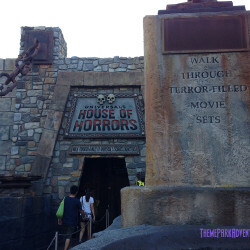 to the Lower Lot, guests can make out another Halloween Horror Nights maze wedged into the space just to the right of Revenge of the Mummy: The Ride. The maze in question is Clowns 3D: Music By Slash. It’s very difficult to get anything good in the way of photos from the angle of view offered when on the Starway, and it looks like nothing more than a black rooftop. It is there however, for fans looking to see it! 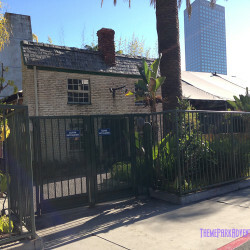 Another Halloween Horror Nights maze that is being constructed in the Lower Lot is An American Werewolf in London. 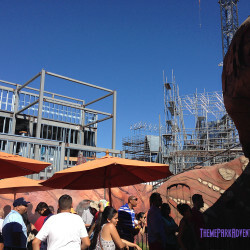 Possibly the most highly-anticipated maze for HHN 2014 here in Hollywood, American Werewolf in London has gone up in the extended Jurassic Park: The Ride queue. 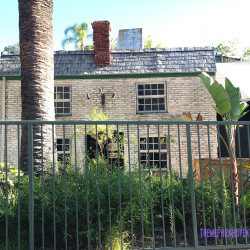 While it’s just about impossible to see the maze anywhere from the Lower Lot, guests can get a great glimpse of its Slaughtered Lamb facade from the trams on the Studio Tour as they make their way into the Backlot area of the property. 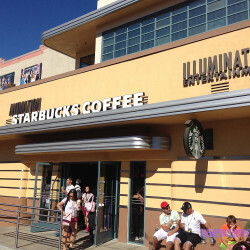 There is a new Starbucks that has recently opened in the Lower Lot, just past the Revenge of the Mummy entrance. 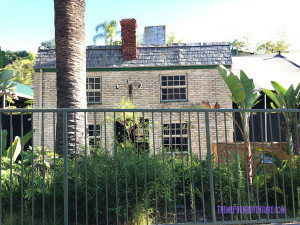 The location is well-designed and obviously, very popular with Universal Studios guests. 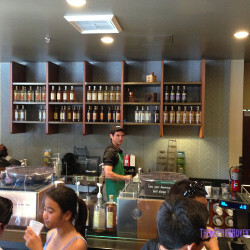 We were a bit surprised – while we went in the heat of a weekend afternoon to shoot pictures for this update, Starbucks was busy, but it wasn’t crazy busy. The operation seems smooth and efficient, and the Team Members get guests in and out of the location pretty quickly. There’s no particular theme at this Starbucks location; it is the standard modern elegant motif found in most of their new locations. 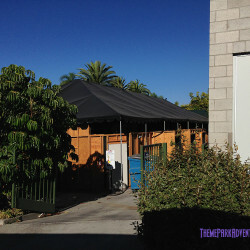 It’s clean, neat and a good addition to the Lower Lot! 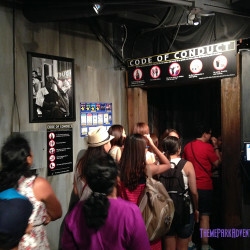 There are new additions to The NBCUniversal Experience, which is located near the entrance to Transformers: The Ride. 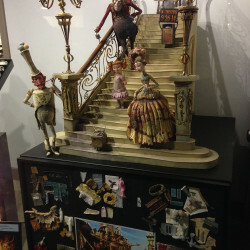 The most notable additions to the ever-changing exhibit space, are figures and model sets from The Boxtrolls. 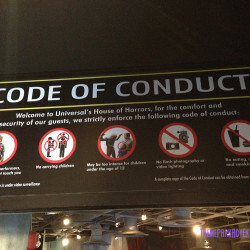 We really enjoy The NBCUniversal Experience, as there’s always something new and cool to check out inside! And on these hot summer days – it is literally a cool getaway from the mainstream theme park crowd! 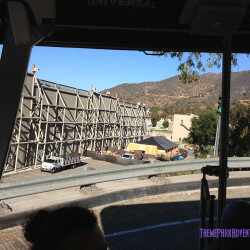 Much of Universal Studios Hollywood’s Halloween Horror Nights is currently being installed in the Backlot, especially the Metro Sets area, which will be home to three mazes this year – From Dusk Till Dawn, The Walking Dead: End of the Line, and AVP: Alien vs. Predator; the latter has been constructed within Stage 747. 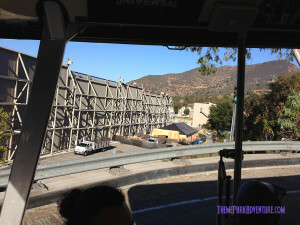 Guests aboard the Studio Tour trams may catch a glimpse of Terminus for The Walking Dead Maze, and as their vehicles turn to enter King Kong 360 3D, one of the mazes – most likely From Dusk Till Dawn – can easily be seen below, behind the Metro Sets section of the lot. 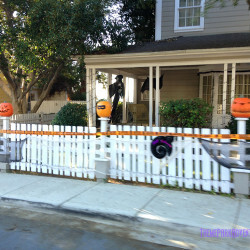 When we rode the Studio Tour, we were surprised to see Colonial Street decked-out in Halloween decorations. For a moment, we wondered aloud if this was intentional, to help spook up the Tour for guests visiting the park this Halloween season. 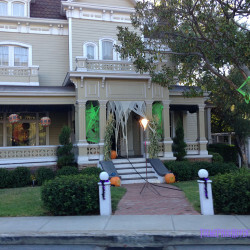 However, our tour guide explained that the street was done up in such fashion so that the television show About a Boy could shoot its Halloween episode there. It was a neat find, though we’re uncertain how long the decorations will actually be there! 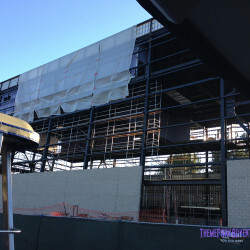 The biggest project taking place at the moment on the Backlot is the construction of the Tour’s new finale attraction, Fast & Furious – Supercharged, which is scheduled to debut in 2015. 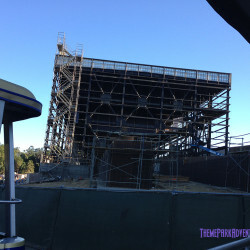 From what’s been disclosed publicly, Fast & Furious – Supercharged will be a 3D experience similar to King Kong 360 3D, but with practical sets as well, in a cavernous show building. 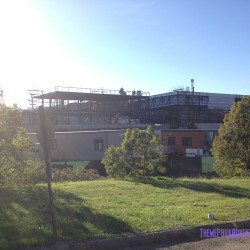 That show building is completely visible as it towers above the entire Falls Lake background. 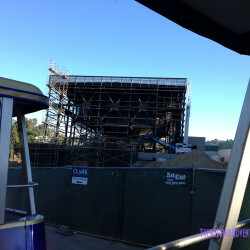 To say it’s huge is an understatement – it makes Kong’s show building look tiny! 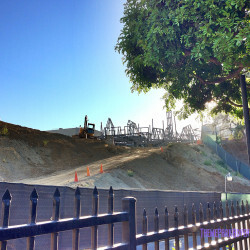 It’s hard to tell at this point, but it looks to us like at least two Studio Tour trams will be able to be in the Fast & Furious structure at once; maybe even three. 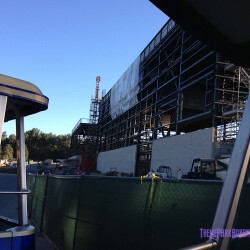 The show building is tall, and is very long; it’s a huge footprint and structure that has guests wondering aloud while on the Tour, “I wonder what they’re going to be filming!” It’s not a film set; it’s what we’re hoping will be a really fantastic, high-octane finale attraction for the Studio Tour, which desperately needs a shot in the arm at this point content-wise. 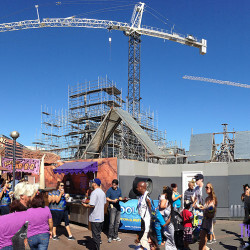 And that wraps up our August 2014 update on what’s new and exciting at Universal Studios Hollywood. 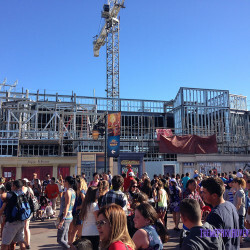 It’s an incredibly busy time for Universal, and as fans, we love being able to witness it all taking place first-hand and bringing it to you here on Theme Park Adventure! 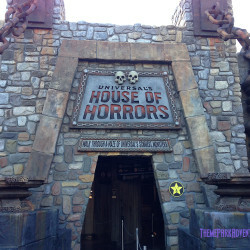 This entry was posted in Haunted Attractions, Home Page, Home Page Slider, News and tagged Halloween Horror Nights Hollywood, John Murdy, The Wizarding World of Harry Potter, Universal Studios Hollywood. Bookmark the permalink.